Artificial Intelligence has slowly but surely crept into numerous areas of the healthcare industry, with real results to back it up. Whether it’s an ultrasound that automates the process of measuring the fetal brain, or an X-Ray system that could help speed up the detection of a collapsed lung, AI adoption is making waves in healthcare. 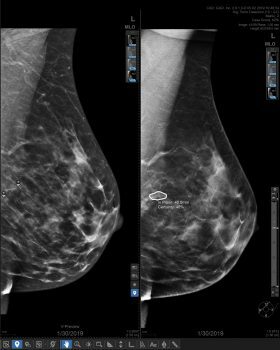 When it comes to breast imaging, AI still holds a lot of promise, particularly as Computer Aided Detection (CAD) continues to grow and develop with the latest innovations in AI. According to an article recently published in the American Journal of Roentgenology, in order for AI to become even more prevalent in breast care, it must demonstrate a positive impact on performance, time, workflow, and cost. ProFound AI scored the case 62% and detected two lesions. On Seno Iris™ the two lesions are marked on the 2D synthetized view; lesions are contoured and scored on the relevant plane. Now, a new AI tool is doing just that. 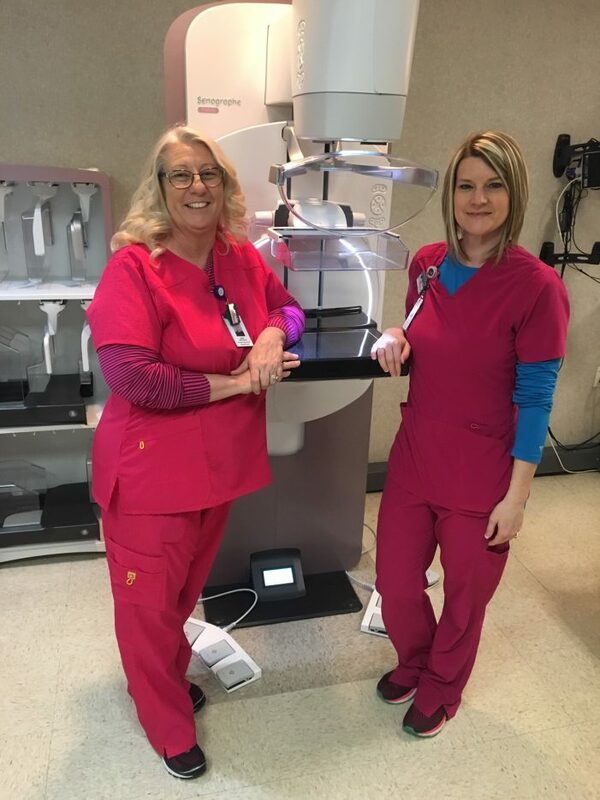 The breast imaging team at Hunt Regional Healthcare in Texas has recently taken advantage of a new AI tool that can come with the Senographe Pristina ™* mammography system. This technology called ProFound AI ™** from iCAD runs on an algorithm trained to detect malignant soft tissue densities and calcifications. The algorithm’s confidence that a detection or case is malignant is scored on a 0 to 100 percent scale. A higher score indicates a higher level of confidence in the malignancy of the detection or case. These Certainty of Finding and Case Scores serve as a guide to help interpreting radiologists determine if a suspicious finding or case needs further workup. 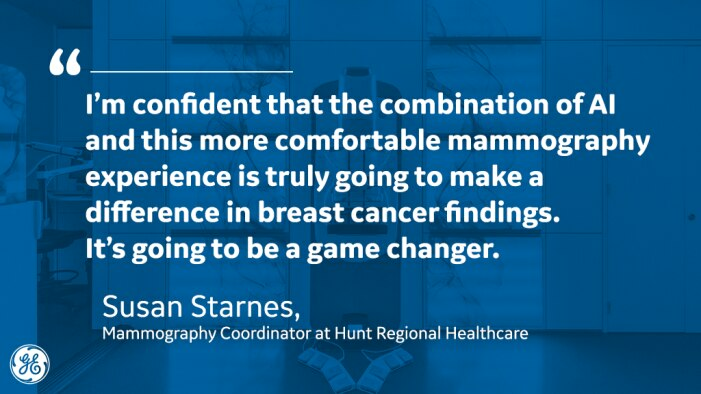 On top of their excitement for this new AI tool, the team has noticed a significant improvement in patient feedback with their new mammography system. 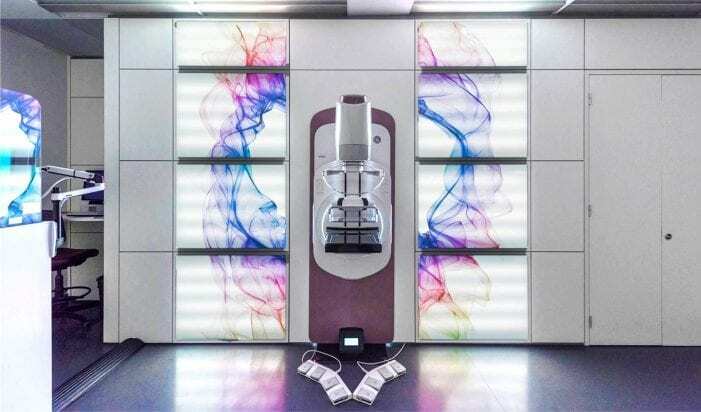 The Senographe Pristina from GE Healthcare was specifically developed and designed by a team of women to change the entire mammogram experience to make it more comfortable. iCAD labelling and user manual, DTM160 rev C.
Reading times may vary based on the specific functionality of the viewing application used for interpretation. **Profound AI is a trademark of iCAD, Inc.